We now have access to BioCyc, a collection of Pathway/Genome Databases (PGDBs). You can search BioCyc by gene, protein, enzyme, or metabolic pathway. You can use advanced tools to view metabolic diagrams, to perform data analysis, and to compare organisms. 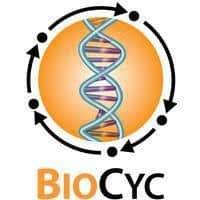 You can register for a free BioCyc account if you would like to customize your viewing preferences, to create SmartTables to store datasets, and to run and save metabolic models. You can export high-quality metabolic diagrams and create your own PGDB from an annotated genome file. These organism-specific databases are divided into three tiers based upon the level of data curation, with tier 1 databases having the highest level of curation by scientists. Tier 2 databases have had moderate curation, and tier 3 databases are computationally created with no curation. Examples of the most popular tier 1 databases are Escherichia coli K-12 substr. MG1655 (EcoCyc), Homo sapiens, and Saccharomyces cerevisiae S288c. When you start out in BioCyc, the default organism database is E. coli K-12. To change to a different database, you can click on “change organism database” at the top right of the page. After you choose a new database, you are taken to a summary page for the database. Then you can click on a chromosome (or genome) to view annotations in the genome browser. HawkID authentication is required for off-campus use of BioCyc. Do you still have questions? Contact the Sciences Library for help!